There are plenty of real estate investment and management companies operating across the country. Most have their own unique take on the business, owing to their respective strengths and weaknesses. For Toronto-based Crown Realty Partners, which has more than $1 billion worth of assets under management in the GTA, it’s all about vision and control. That approach allows the company to work “faster and better,” he added. Crown, which is backed by pension funds and other large investors, is a picky purchaser, Miller explained. That might include instituting a lease up program, filling a stubborn vacancy or preparing for a future wave of lease expirations. “We try to take the risk away from the income and stabilize it. The second thing we try and do is most of these assets have not really had any “vision” to them, it is like fix what is broken and repair,” he said. Many of the buildings Crown has purchased are Eighties-era properties with amenities that date back to that less tenant-friendly period. Often when the company purchases a property it will add features such as bicycle lockers, showers, electric car charging stations and a free Wi-Fi in common areas. Crown looks to add food and transportation services to properties if it finds them to be inadequate. For example, it operates a shuttle service from a few of its Toronto properties (one links its building at 155 Gordon Baker Rd. to Fairview Mall) and another links Union Station to its 901 King St. W. building (shown in the image above). It’s not a unique viewpoint, as most properties owners are trying to up their appeal to attract new tenants and keep the ones they already have. Crown currently owns the vast majority of the 36 buildings (5.2 million square feet of office space) it operates in the GTA. Crown did add a property management contract this month: for the 371,000-square-foot Munich Re Centre at 390 Bay St by owner Munich Re. Given its location close to the city’s main courts, the building’s main tenants will be law firms and other associated businesses rather than major financial firms. Miller would not say what is in store for Munich Re, beyond the “high-quality, cost-efficient and sustainable environment” for its tenants, as related in Crown Realty’s recent announcement of the contract win. 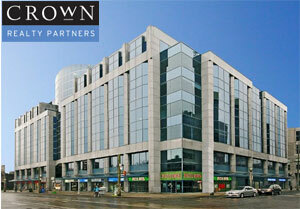 Crown Realty used to operate in Winnipeg before retreating back to its GTA base. It is currently entertaining the idea of expansion once again. Given the company’s preferred strategy of purchasing and breathing new life into under performing properties, a logical question would be just how big is that base of potential acquisitions? Given all the attention paid to building operations, it might appear opportunities would be few and far between. Miller said that is not the case. “There are lots of properties that fit that criteria. The problem that we are running into, no different than anyone else, is the pricing expectations from the vendor who just thinks there is so much capital” to buy properties.